Beginning in 2009, Upper Crust Food Service has been dedicated to serving fresh, healthy, and most importantly delicious, meals to chapter houses all across the nation. We witnessed a lack of consistency and quality when it came to food catering services for fraternities and sororities, and we decided to be the change. We know the importance of your time in college, and we wanted to help students everywhere in any way that we could, and for us, we found no better way to enhance your experience by providing incredible meal plans and catering all of the special events your chapter house attends throughout the year. With college already being one of the most influential and exciting times that you’ll experience, being involved in the Greek life adds a special, dare we say, seasoning to your time. 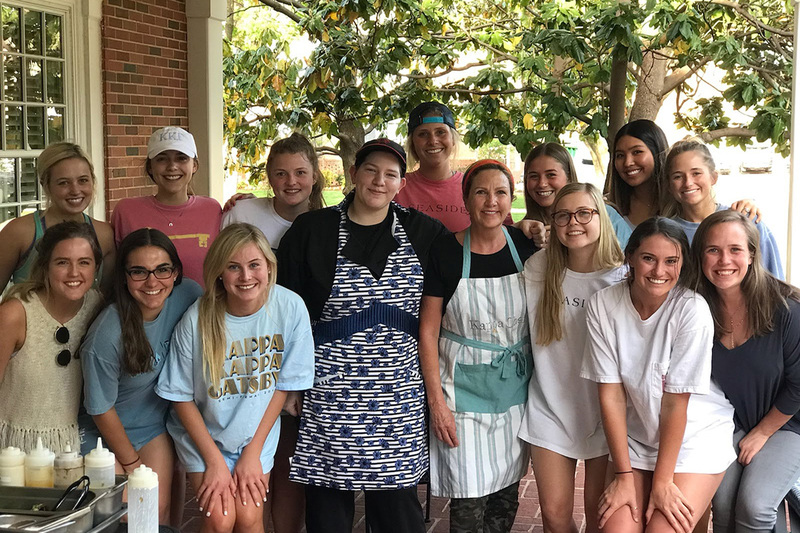 We provide our college catering services to hundreds of campuses and we’ve witnessed first hand just how advantageous it is for students to be involved in a fraternity or sorority. In this post, we’ll be delving into just a few of the countless benefits that Greek life provides. If you’ve seen us around campus and your chapter is in search of college food services, or if you’d like to bring us to your school, pick up the phone and give us a call! We love what we do, and want everyone to be able to enjoy our catering! No matter what position you are in your fraternity or sorority, you’re going to be assigned a multitude of duties to help your chapter house. Whether you’re helping to organize a special event, manage the finances, or even taking charge of the cleaning duties, each and every experience will help get you ready for the real world. Greek life helps students realize that in order to live a successful and happy life, you can’t lay idle. Things need to be taken care of! The multiple tasks that you’ll be taking care of, and the lessons that you learn, will stick with you long after you’ve received your diploma. This will provide you with a certain edge when it comes to landing a job or even taking care of your home. Along with learning how to help your chapter in every way possible, you’ll also be gaining certain leadership skills that will also stick with you for the duration of your life. Especially as you become one of the leaders in your fraternity or sorority, you will learn what it takes to be a leader and gain the trust of others. By taking on a leadership position, you’ll learn the importance of proper organization and become adept at your time management. Part of this includes balancing your social life and activities (because part of college is having fun and making friends) with the duties you have for your chapter. Another great benefit that comes with being a part of Greek life, is that you’re not restricted to the campus. A big part of the fraternity and sorority experience is learning how to help your community in any way that you can. While you learn to plan and throw philanthropy events, you’ll learn just how great it is to help others. Once you graduate and find yourself out in the “real world,” you’ll be incredibly surprised with the connections you’ll make because of your time in your fraternity or sorority. You’ve become part of an organization, and no matter where you might find yourself down the road, the odds are incredibly high that you’ll run into a fellow “brother” or “sister.” This networking system will not only help when it comes to employment, but many other situations where having a connection is an incredible advantage. This list would not be complete without bringing up the main benefit that comes with Greek life. We’ve said it before, and we’ll say it again, the friendships that you’ll form while in your organization become more than just a casual acquaintance, but more akin to family. You’ll meet some people during your time that will be with you for life, we guarantee it. Through all of the events you’ve thrown together, the late night study sessions, the highs and the lows, you and your brothers and sisters will be bonded forever. While you’re having a blast and preparing for life outside of college, we’ll be there, serving you healthy and mouth-watering food. 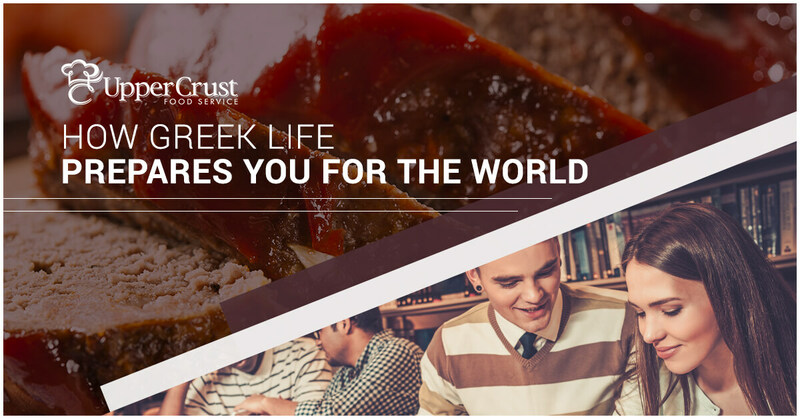 From our daily fraternity and sorority meal plans, to study snacks, to special events, our dedicated campus chefs will have the food that your stomach is craving. We are committed to being the best college food catering service in the country, and we use your feedback to get better every single day! Is your chapter house in need of quality, fresh, and responsibly sourced food? We’d love to show you what we can do. Contact Upper Crust Food Services today!